We are going to take a look into what a bee smoker is and which are the affordable, yet highly effective bee smoker products available in-stores. Additionally, we are going to briefly discuss the main components of a bee smoker as well as how it works. Therefore, if you are looking to buy a bee smoker, read further and let us help you narrow down your choices. What is a Bee smoker and what are its components? Advantages and Disadvantages of a Bee Smoker? Where can I find the best Bee smoker for sale? A bee smoker is a piece of equipment used to calm honey bees. It puffs smoke into the hive to protect beekeepers from being stung when the honey bees get too aggressive. When a bee is startled, threatened, or injured, it will emit pheromones that signal the other bees a distress call. In return, these bees will start to be more aggressive and will also release their own pheromones. This is where the beehive smoker comes into play; it emits smoke that masks these pheromones and interrupts the bee’s defence mechanism. Beehive smokers are essential for the safety of every beekeeper. The typical beehive smoker equipment is very simple. The smoke chamber is the metal cylinder which acts as the furnace that produces the smoke. On top of the cylinder is a truncated cone that acts as a nozzle where the emitted smoke can be directed. There is also the bellow which is found on the side of the cylinder which needs to be pumped to blast air in the furnace for the smoke to be released. A heat shield is also found around the metal cylinder to protect yourself from being burned as well as a breather plate and a bottom bracket to keep the bottom part of the equipment cool. Most bee smokers have also added mounting hooks for easy suspension near bee hives or for easy storage. Just like all other animals and insects, bees are beyond our control. If they feel threatened or if they are injured, their response is to destroy or attack any form that poses a threat to their lives. If you don’t have any means to at least minimize the chances of being stung, then keep away from the hives. Bee stings are quite dangerous and can cause allergic reactions to some. As such, as a beekeeper, it is of your best interest and for your safety to always have a bee smoker ready. As for the disadvantages, there is simply none. That is how important a bee smoker is in maintain your safety during beehive inspections. As the famous saying goes, better to be safe than sorry. Using a bee smoker is not complicated. It is designed to be used easily, without any difficulty. The primary step is to start a fire inside the metal chamber. First, you simply have to open the lid where the cone is located and start a small fire. You can use paper, herbs, burlap, wood chips, or other smoker fuel of your choice. Take note, however, one must refrain from using smoker fuels such as newspaper and hardboard pieces because it contains ink and toxic substances that might emit noxious smoke. Once the fire has already started lighting up, you can now add more stuff on top to keep the fire burning and get some smoke. Give it a few more puffs and make sure that the smoke is not how before you close the lid. The smoke will then be released from the nozzle and don’t forget to puff once or twice every 5 minutes using the bellow. Check the smoke regularly for smoker fuel to keep the light on fire. Since you are here looking for the best bee smokers on the market, chances are, it is probably your first time handling one. Setting aside what you already know from any potential discussions about starting a fire, we have gathered additional tips from bee experts and professionals for you to use to ensure a safe and effective bee smoking procedure. Be careful in approaching – It is recommended to take slow strides in approaching the hive. Just like any other animals, bees can get startled and when they do, they release their alarm pheromones and might get aggressive. We know you have a bee smoker to help you, but it would be best for the bee’s hive integrity to remain calm and unstartled. Weather influences the temper of bees as well as their working conditions – It is recommended, but not an absolute rule, to check bees is when the weather is warmer, and they are busy searching for pollen. During this time also, they are generally calmer, and you don’t have to deal with a lot of them since they are not in the hive. Of course, a lesser number of bees would lessen the chances of being stung. Never overdo smoking – If the smoke is not put into moderation, chances are these will drive the bees completely away from the hive. They would tend to eat up more honey as a response to the threat, just like how humans would get their most valuable possession during a fire. In addition, the smoke might stick in the honey which would lead to a not so sweet taste. Periodic puffs in intervals of 2-5 minutes are recommended to keep the bees under control. 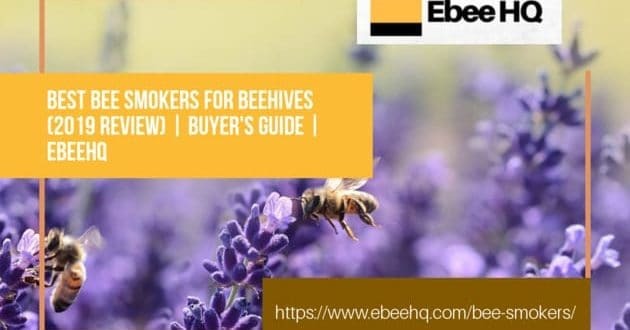 Listed below are the best bee smokers found on the market for 2019. They are bee smokers with high recommendations from customers, due to their affordable price and great performance. Because we aim to keep our customer’s needs at the top of our priority list, we have listed the best honey bee smokers in order from least expensive to the most expensive. Therefore, without further ado, here are the Top 10 Best Bee Smokers. Honey keeper’s bee hive smoker is the best quality smoker you can get without having to break the bank. It is equipped with a stainless-steel smoke chamber and a heat shield to protect you from burns. A mounting hook can also be found for easy suspension. To help with airflow, the bellows are made with leather coupled with a heat aerator. This unit by Honey Keeper has gotten mostly positive reviews, commenting on how well the bee smoker works, considering it’s priced so inexpensively. It works just how a normal bee smoker should work. Based on the majority of customer reviews, this unit is definitely one you should get if you are not looking for anything fancy or complicated. If you are looking for a decent beehive smoker for a cheap price, then this product by Honey Keeper is the perfect match for you. Reviews have recommended this product to be used for beginners or those who do beekeeping as a hobby because it does not cost much but it does the job right. It is simple, effective, and affordable, which is just what is needed for a functional bee hive smoker. This VIVO product is one of the best bee smokers you can buy at an affordable price. It is equipped with a heat shield attached with a mounting hook on its side for safety and storage as well as a thick, perforated firebase to ensure ventilation and airflow. The leather bellows are also pretty easy to pump and are actually durable. 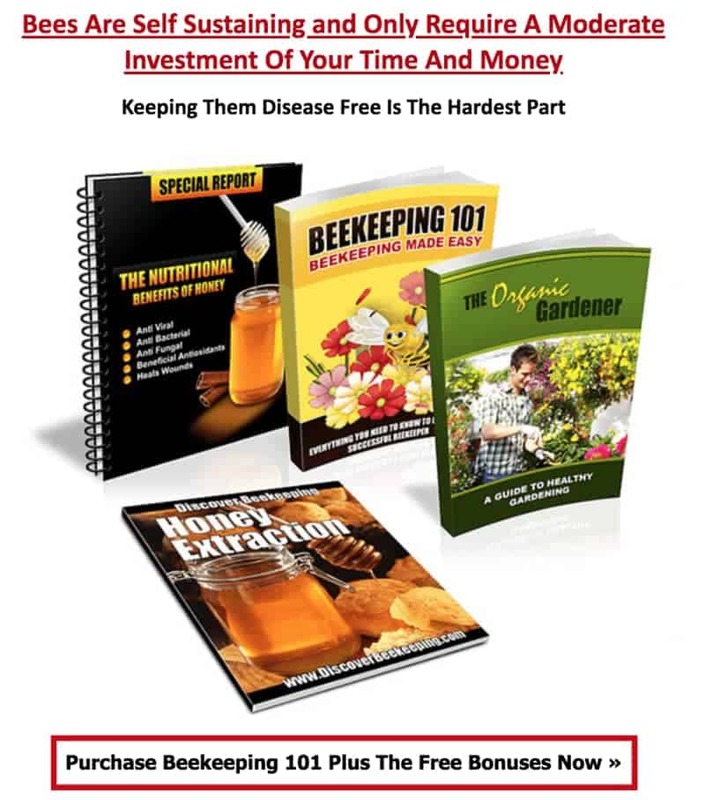 It is highly recommended by professionals for those who are beekeepers as a hobby or doing it professionally. If you want an affordable and effective bee smoker then this product by VIVO is definitely also the right choice for you. However, there is not much difference with the Honey Keeper product as aforementioned. Yet, many of the customer reviews are positive which is exactly what you want to see. Please not, that when using the product, as with any other bee smoker, the equipment can potentially get very hot, which is why it is recommended to be aware on the amount of smoker fuel placed inside. Another customer has also suggested bending the legs so that the bottom part of the equipment will not burn where it is placed. Overall, the bee smoker has a pretty good reputation with the beekeeping community. It is suggested that beginners buy this or those who do not regularly smoke beehives. It is definitely not one for heavy usage but at the low price of $14.99, the beehive smoker equipment will still already do the job. Harvesting honey and doing a beehive inspection has been made easier with CO-Z’s Bee Smoker. It is furnished with a built-in-in heat shield for your safety and it is made out of stainless steel for long lasting use. It also has a removable base plate for maximum airflow. Not only that, but it also has a base plate which is removable and punctured to allow maximum airflow in the can. For a decent bee hive smoker, this product definitely does a great job at such an affordable price. The product definitely has earned positive reviews for a reason. It is well constructed and very easy to use. The leather bellows are also of very high quality and do not wear and tear easily. The unit is also lighter as compared to other standard beehive smokers, so it is definitely fit for those who professional beekeepers as it is easy to carry from place to place. The bellows are also very good blowers because it does not need constant puffing to ensure smoke goes out. 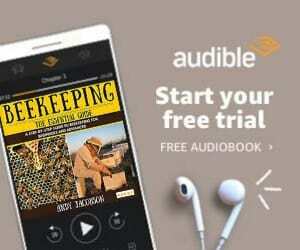 This is perfect for anyone who does beekeeping as a hobby or professionally. This Bee Hive Smoker Equipment by Aspectek has all the features you need for safe beekeeping. It is known for its efficient design in providing safety. When you are a beekeeper, it is vital and essential to always shield yourself. You can never tell when bees are aggressive, but when they are, it will be out of your control… Unless you have a bee smoker that is. This smoker has a firebase plate for an effective smoke airflow, and it is made with stainless steel to prevent rusting. It has the metal shield needed for safety that will assist you in calming the bees and a vinyl leather bellow for effortless pumping. This product by Aspectek has a very commendable reputation among beekeepers. Customers have praised the quality of the bee smoker, especially the metal heat shield which is solid protection against possible injuries. Its bellows are also easy to pump and creates smoke seamlessly. This is absolutely the top choice when the biggest factor in your list is safety. This bee smoker provided by Aspectek is also the lightest among the list, so it is pretty convenient if you are like to carry it or if you have honey bee hives from different places. If not, you can still opt to use the mounting hook that is attached in the bee smoker for easy suspension and storage. In conclusion, this beehive smoker is a decent unit for your beekeeping equipment at a low rate. It works just as well as any expensive bee hive smoker and its parts are not too complicated for you to use. HOONT is a well-known outdoor equipment supplier. As such, their products are renowned to be of high quality, because they remain to be one of the best go-to’s for any outdoor needs. This commercial grade bee smoker by HOONT is made out of high-quality stainless steel that will surely be free from rust for a long time and a superior metal heat shield to keep you away from any injuries. It also boasts of a heavy-duty oxygen tray that will surely make lighting a fire easier and breezier. It is one of the unique extra features that this product by HOONT has. It also has an added metal hook design which will be convenient for placing the bee smoker in an area next to the colony or even in the storage area. This is a very simple piece of equipment with all the basic parts for a bee smoker. Reviews have given it a generally optimistic review and left customers satisfied and even shocked by how good the quality is despite the cheap rate. By far, it has been praised for the additional oxygen tray which makes fire ignition easier as ever. However, most customers have stated that the bottom part of the unit tends to get hot so, as a solution, it is recommended that the three tabs in the inner disc be bent downwards to allow airflow in the unit. You definitely will get what you pay for with this product. In addition, the price is not that far from the least expensive products listed, so if you have extra money to spare, this is definitely a good choice for you. Equipped with heavy construction materials, Agralogix’s Bee Smoker does not fall far behind as the best bee smoker on the market. For protection, the stainless-steel material is surrounded by a solid cage of the heat shield that will surely make your bee smoking experience safe and injury free. It has durable leather bellows and the beehive smoker is one of the products that is solely manufactured in the United States, hence the American Design. Many of the customer reviews have given it positive feedback except for one specific flaw. The fire tray located inside the can has the tendency to fall off after a couple of uses, so it is recommended to keep in storage a few of the things. Therefore, this is recommended for light use, for backyard beekeeping or occasional beehive smoking. None-the-less, overall this product can do the job and is fantastic value for money, but there are better alternatives that we have mentioned, such as the VIVO BEE-V001, which is also cheaper. Nothing is more reassuring than buying a product from a reputable company. One of the best beekeeping companies in the market is Goodland Bee Supply. It has prided itself in producing top-notch quality beekeeping equipment and kits. This bee smoker product by Goodland Bee Supply not only gives you the beehive smoker, but also provides an additional 3 packs of smoker fuel. Smoker fuel actually costs a lot, so you are surely going to save money if you like using smoker fuels. The smoker fuels are made out of mugwort which is a common plant used for medicinal purposes. This piece of bee smoking equipment is made out of stainless steel and a mounting hook for your convenience in storing the unit. The product also guarantees an efficient airflow by having a perforated pellet stand. If you would like a bee smoker in which you do not have to regularly check the fuel, then this product is definitely for you. Reviews have praised its larger size compared to other bee smokers because it can hold more fuel. The bellows are also pretty easy to control which makes fueling the fire pretty safe and unchallenging. This product by Livestock Tool is perhaps the most well-known electric bee hive smoker. Its metal chamber is made out of stainless steel to prevent rusting and a heat shield to protect you from any possible burns or injuries. A mounting hook is also added for easy suspension and storage. It also has a handle which replaces the bellow. The handle is a battery-operated blower which you can press to create fire and add more smoke. The electric blower is a very sturdy blower which will definitely make your access to the beehive colony easier to go after to. Many have overlooked the capability of an electric bee hive smoker, but for the customers who tried it, it has received nothing but praise for the technology. Reaching the maximum smoking potential is a very quick process for the electric smoker. The firebase tray is also pretty solid and does not thin out easily. The only issue is that the 4 “AA” batteries needed are not included in the package, but batteries are definitely always available in convenience stores or supermarkets. So, if you are looking for innovative beehive smoking equipment, then this electric bee smoker will be the right purchase. If perhaps, you are not looking for just a beehive smoke, but instead an entire kit then this may well be for you. The bee smoker is included in the kit, and is highly talked about… Because of this, we can’t resist putting it in our list of recommendations. Starting with the kit, you will not only get a high functioning bee hive smoker, but you will also have an uncapping fork tool, a frame grip, bee brush, extracting scraper, and a bee feeder tool. 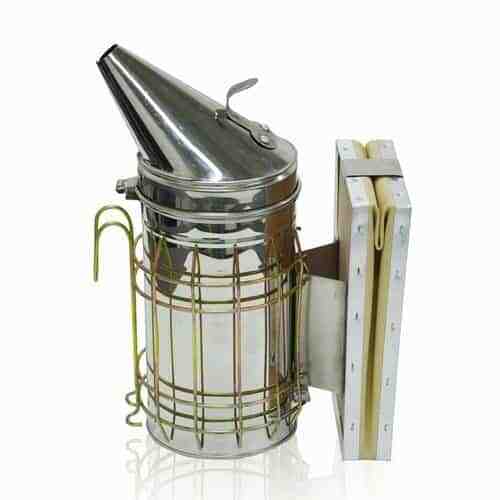 The beekeeping smoker equipment has all the necessary parts for an effective bee smoker. It has the metal chamber, the bellow, and the heat shield. The bee smoker also has a mounting hook for your convenience in hanging the smoker near a colony or when you are keeping it in storage. As one of the best beekeeping kits on the market, this product by The Magnificent Bee is highly recommended if you’re looking to purchase a kit, as opposed to just a bee smoker. You will get a bee smoker that is made out of stainless and has a heat shield that will protect anyone from injuries, especially those who are new to the beekeeping hobby. Not only is the beehive smoker very efficient but you will also get other equipment that is easy to use and very handy. Surely, at a price lower than the most expensive equipment and not that far from the least expensive, you will definitely get your money’s worth with this starter kit. Although it is considered a beekeeping kit, even professionals and beekeeping hobbyist use this product. Mann Lake offers its best bee smoker product with HD540. Mann Lake is one of the top beekeeping equipment suppliers around the world and their products have kept them in the game for up to 30 years. They are at the forefront of beekeeping equipment’s and is a leader in the industry due to their high quality. The product is made out of heavy-duty stainless steel ensuring rust-free equipment. It is perhaps the only product featuring a replaceable leather bellow in contrast with other bee hive smoker that uses leather bellows. For optimal safety, the metal heat shield has a lower bracket placement to prevent burning. If you have money to spend and you are out to get the best beehive smoker in the market, then Mann Lake’s HD450 Bee Smoker is definitely the right product for you. It has an amazing reputation amongst customers. Perhaps the most complimented feature it has, is the replaceable bellow and a lid tab that is easy to open. Albeit expensive, if you are looking for a high-quality bee smoker that will last a long time, then you should look into buying this product. If you even think about it, you can actually save your money by buying a more expensive, high-quality bee smoker for one time rather than replacing a couple of low-quality cheap bee smokers over a period of time. To ensure a hassle-free bee smoking, we have made an additional list for you to see what the other equipment is used for bee smoking that might not be included in any of the packages. Natural Smoker Fuel – Natural smoker fuel are available anywhere. Organic materials such as dried leaves, herbs, flowers, or any other plans can be used as smoker fuel. This is definitely preferable than using newspaper which contains ink that might be toxic and produce noxious smoke. Wood Pellets – If you do not want to use newspaper or dried leaves, you can definitely buy wood pellets as smoker fuel for your beekeeping smoker. Wood pellets are also a great option for smoker fuel because they last longer, and they come in a bag which is convenient to carry. Smoker Pellet – Smoker Pellets are made out of herbs which is clean and safe for the bees. It burns for a pretty long time of 15-20 minutes and actually relaxes the bees calm down. Beekeeping Bee Brush – If you want to check a beehive without any bees or you already want to transport the beehive to a honey house then you must definitely get a bee brush. Never use a generic brush because it might injure the bees and agitate them. Buy a bee brush that has soft gentle bristles that will safely remove bees from the hive. Bee Hive Frame Holder Grip Tool – Of course, the primary goal of every beekeeper is to maintain a healthy beehive and bees. You can check on your hive by buying a frame holder and make sure that it is durable, comfortable, and has a strong grip. You would not want to waste your honey bee’s effort if you drop their bee hive right? Bee smokers are definitely a very important tool in beekeeping. That is why it is of our best interest to provide you with the best equipment you can get at a very affordable rate without compromising quality. Based on our research, public opinion, and recommendations from professional, the best beekeeping smoker would be the VIVO – Bee Hive Smoker with Heat Shield Beekeeping Equipment (BEE-V001). It is very easy to use, and its materials have been highly praised by most users. In fact, in most of our research, this product has always been at the top of the list, not to mention that it is also very affordable for beginners and experts. In addition, we suggest that you always go for natural organic smoker fuel. They will surely not cause any toxic reaction to the bees and in addition, you can save money as well as clean the surroundings if you are opting to use dried leaves. There is absolutely a large array of options you can choose from. We hope that with our list, you will be able to choose the right bee smoking equipment that will satisfy your needs. Bee safe and bee happy as you go on your beekeeping journey in 2019!